Alex Sotheran is the Archaeology Manager at Elmet Archaeological Services Ltd. Alex has worked in field archaeology since 2001 after graduating from the University of York and helped to set up Elmet Archaeology in 2009. He has a particular interest in the First World War and has worked on battlefield sites and training areas in the UK, France and Belgium. In 2013 Alex graduated with an MA in British First World War Studies at the University of Birmingham. Elmet first opened its doors in 2009 during the student training excavations at Brodsworth in south Yorkshire. These training digs were run by Sheffield and Hull universities and were a chance for the archaeology students at both universities to undertake some archaeological fieldwork. The Brodsworth project was also open to members of the public and it was noticed by Elmet’s founder, Christine Rawson, that there was a demand for archaeological volunteer work from people in the local areas of South Yorkshire. Archaeology is one of those subjects that many people are interested in but few get a chance to actually take part in any hands on work, so Elmet was set up with that in mind. It was intended to create a company that would specifically allow members of the public with no background in archaeology to take part in archaeological investigations with full training provided. Therefore, Elmet was not only directed by community involvement but also steeped in educational outreach as well. The company largely depends on funding from various community bodies across the UK, including, but not exclusively, the Humber Learning Consortium, the Heritage Lottery Fund, the Council for British Archaeology and the Coalfield Regeneration Trust. One of the first projects began in 2010 and was conducted alongside the University of Sheffield at Monk Bretton Priory; the two-week project attracted over 300 people through excavation work on a Tudor mansion and local history and family sessions. On the back of this success, the Dearne Valley Archaeology Group was created with help from Elmet staff; it is now self funded and features regular talks on archaeology from various experts. 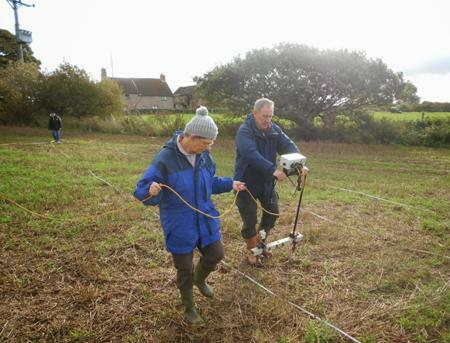 Elmet Archaeology Investigates the site of Ulley in South Yorkshire, where geophysics was used to determine the nature of the archaeological remains beneath the field. Image credit: Elmet Archaeology. In 2011 work began at one of Elmet’s long running projects, the Hickleton Hall Prisoner of War Camp. 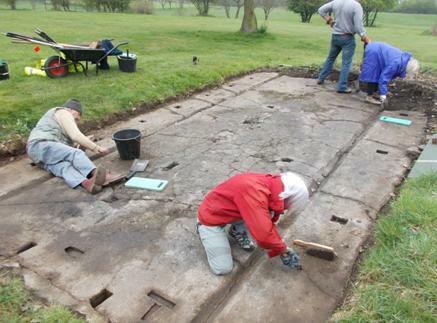 Whilst searching for prehistoric remains the team came across the remnants of a Second World War camp, first used by I Corps as a headquarters and then used for housing prisoners from Germany and Italy. The project is ongoing and 2014 saw a new season of work uncovering concrete hut bases, again with the help of volunteers. Alongside the fieldwork was a project strand which aimed to collect memories and stories from local people who had experienced the prisoners first hand, one lady told us that two Italian prisoners would call round to her parent’s house every Sunday for tea! The summer of 2013 saw staff from Elmet branching out into various commercial archaeology jobs. The sites were in North Yorkshire and various levels of archaeological investigation were stipulated by the county archaeologist before wind turbines were erected. One of the sites had a Romano-British boundary ditch running through it, but very little else. In 2013 another large-scale project was completed after Rotherham Archaeological Society had approached Elmet with the intention of locating a possible Roman fort at Ulley. This project took the form of a fieldwalking exercise and geophysical survey of a field that had been identified as containing a Roman fort by the one of the society’s founders, Mr Philip Smedley. This potential site was flagged up in 1953 and the project was carried out as a memorial project for Mr Smedley. Unfortunately the results proved negative and it appears that Mr Smedley had misidentified medieval ridge and furrow marks for the layout of a fort. However, the project engaged over a hundred people in their local history and taught them archaeological skills at a basic level, further to this the project helped to raise the profile of the Society and increased their membership. We like to think that Mr Smedley would have been pleased with what was achieved by the Rotherham Archaeological Society and Elmet. 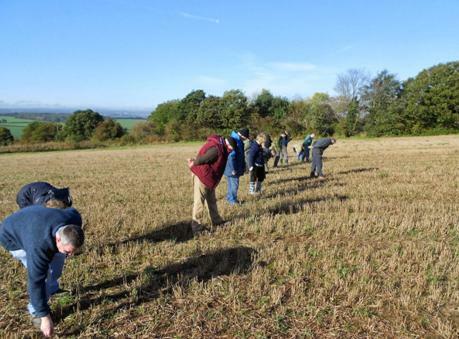 Members of the public taking part in field walking a site, looking for surface finds and artefacts that could indicate the nature of the archaeological remains underneath. Image credit: Elmet Archaeology. The winter of 2013 saw Elmet excavating a cementation furnace in the industrial heartland of Sheffield’s Kelham Island. This large brick-built structure dated to the middle of the nineteenth century would have been capable of producing large amounts of steel and was part of Sheffield’s industrial growth. This was a commercially led project so only two members of staff were on site to conduct the work; however, we still continued our commitment to the wider community by sharing photographs of the project as work progressed. In April of 2014 Elmet began work at the Silverwood Scout Camp, which previously had been the training ground for the Barnsley Pals during the First World War. This project was particularly pertinent given the centenary of the First World War was just around the corner when the work began. Again community members were involved in the geophysical survey and excavation of several concrete bases which formed the ablutions and latrine blocks of the First World War camp. We even had a visit from the retired Colonel of the Yorks and Lancs Regiment whilst on site! It is not just all twentieth century archaeology though, in 2013 and 2014 Elmet worked with the Wetlands Archaeology & Environmental Research Centre (based at the University of Hull) at Sutton Common, close to Doncaster. The site at Sutton Common has an Iron Age enclosure, surrounded by banks and ditches and a complex entrance way. However, Elmet were concerned with rather older remains, in the form of Mesolithic flint scatters and possible structures, which were located on the edge of a palaeochannel. Volunteers and students from various universities helped on the work and it proved to be a rather interesting site. After highlighting the archaeological features of this trench at the WW1 site of Silverwood, excavators define the features by cleaning back the soil. Image credit: Elmet Archaeology. Outside of archaeological investigations, Elmet have several other strands of community involvement, one being our weekly reminiscences group which brings together people suffering from dementia and gives them an outlet to attempt to alleviate their condition. We also host a weekly family history group, where access to computers and heritage websites are provided to the attendees. The next big project for Elmet is the investigation of a back garden in a village called Swinton, near Rotherham. This is an exciting new venture for Elmet as it is a crowd-funded excavation, something we have never tried before. The project came about after the house tenant, Mr Andrew Allen, found a surprisingly large amount of Roman pottery during gardening work. Not knowing what to do with the finds Andrew contacted Elmet and we decided that we could excavate the garden, teach people the rudiments of archaeological excavation and recording and hope to understand what a large deposit of Roman artefacts was doing there in the first place! The project can only be carried out by the willingness of people to donate to the fund and each strand of donation has its own reward, with the larger tiers carrying a chance to actually come and excavate with us! There is more information on the Sponsume site for our project, it can be found here. Elmet has also hosted several yearly Dearne Valley Archaeology Days, where we have attracted speakers from all over the country talking on a variety of current archaeological topics. Each year has been well attended and has grown in size and scale with each event. The 2014 event was a resounding success, with speakers such diverse topics as blogging in archaeology, the archaeology of Sherwood Forest, Egyptian mummies and Scottish hill forts! This is a tradition that is set to stay and only grow! Elmet have many future projects on the boil, including a return to Hickleton and Silverwood. Beyond this we hope to expand into education and training with our series of monthly archaeological workshops. These are open to members of the public and are taught by experts in many fields. The workshops we have run already have been well attended and received and included the varied themes of human and animal bones, stratigraphy, illustration, industrial metal working, GIS and a whole host more! We have several fieldwork opportunities in the future that we are working on, so please drop us a line or follow us on Facebook or Twitter to see our regular updates! Details on the Elmet Archaeology’s remaining 2014 workshops (topics include an introduction to human evolution, map regression and archaeological illustration) can be found on the above link on their website. The workshops are often held in Wath-Upon-Dearne, South Yorkshire, on Saturdays throughout the year. Elmet have a Facebook project page for Unlocking Swinton’s Roman Past, and you can also sponsor the excavation and research with a donation here. Backers of the project can choose what level of involvement they’d like in the project (dependent on the amount donated), and they can also take part in the excavation themselves and receive copies of the report produced. The Dearne Valley Archaeology Group regularly meet up to discuss heritage and archaeology in South Yorkshire. They hold monthly lectures from specialists around the region on a variety of topics. 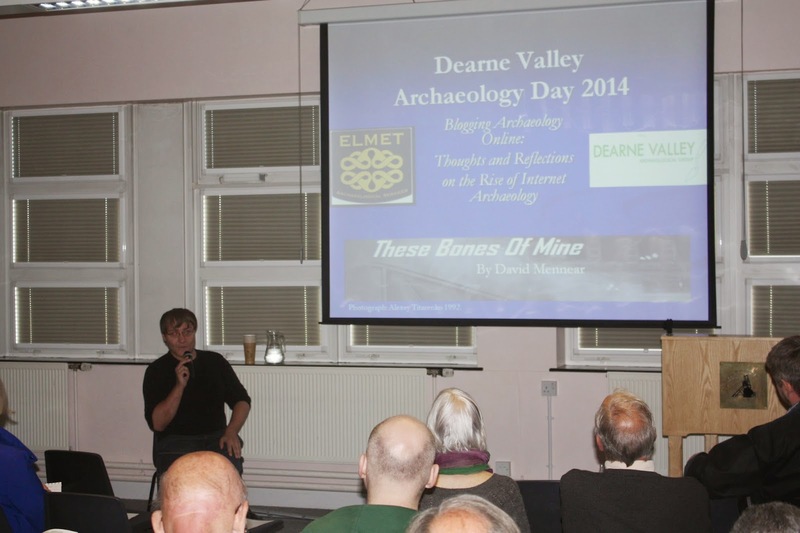 DVAG also help Elmet Archaeology with their annual Dearne Valley Archaeology Day conference. (I can attest as to how good these conferences are as I attended and spoke at the magnificent 2014 edition!). I recently had the great pleasure of attending the Dearne Valley Archaeology Day (DVAD) 2014 conference, which was organised by Elmet Archaeology and the Dearne Valley Archaeology Group, in Wath upon Dearne, South Yorkshire. As readers of this blog may be aware that I recently posted my own abstract for the talk (here), which focused on the value of blogging archaeology and introduced this blog to members of the public as well as to archaeologists and historians. It was certainly a first for me to talk at a conference, and I had never thought that I’d actually be talking to an audience about blogging and my own site, but it just goes to show you never quite know where blogging will take you. 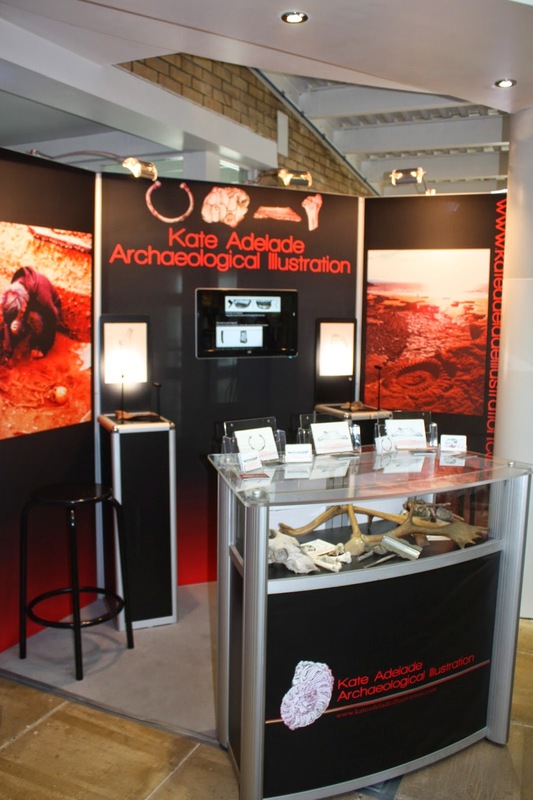 Kate Adelade‘s archaeological illustration stall. Kate has previously wrote about cannibalism for this blog here. The event was well attended and included a great range of speakers who covered a variety of topics in the archaeology and heritage areas. As well as the speakers (a full list can be viewed here), there were also stalls on a number of projects from around the local area. Jennifer Crangle, a PhD candidate at the University of Sheffield, was present as well with her stall on the medieval Rothwell Charnel Chapel project (of which I’ve previously discussed here) and Kate Adelade had her modern presentation displaying her fantastic archaeological illustration skills on show. In fact I was quite impressed by each and every speaker at the day long conference, especially by the different styles and approaches that they all took. I also learnt a great deal about various projects around the UK and further abroad. Humour, as I discovered, really can help a talk a great deal too. David Connolly, of BAJR and Past Horizons fame, really proved this during his animated talk about the Scottish hillforts (or rather ramped and ditched enclosures of unknown date and function) in the Lothians, as part of the on-going Rampart Scotland project. David’s talk focused on the Iron age site of Sheriffside for his talk, and the great work that him and his team of volunteers underwent to target viable radiocarbon samples to help phase the site. There were some great talks on community projects too, such as Mercian Archaeological Services CIC on-going Sherwood Forest Archaeological Project and a nice little round up of the great work that Elmet Archaeology have so far conducted in South Yorkshire. Elmet further whetted the audience’s appetites by highlighting some future projects as well, including the investigation of a WW2 POW camp at Hickleton Hall, near Doncaster, which promises to be pretty interesting in unearthing the physical remains of a legacy of war. There were also talks that really grabbed my imagination in the size and scale of their ambitions and detail. The first was by Victoria Donnelly, a PhD candidate at the University of Oxford, that focused on her research on the grey literature of the archaeological record. This is a part of the fascinating EngLaId project, which aims to characterise and explore the extent of the archaeological landscape in England by studying English archaeology from 1500BC to AD1086. Victoria focused her talk on her own research into the grey literature and, with the use of GIS magic (Geographical Information Systems), provided some great examples highlighting the focus of commercial archaeological investigations. Who, for instance, knew that, in England, Suffolk County Council are one of the bigger archaeological researchers in England? I certainly didn’t and it was an eye opening presenting into the mystery of the oft maligned grey literature that all archaeological investigations produce. Of a particular interest to me, due in part as of having studied in Sheffield itself, was Andrew Whitham’s talk on the Sheffield General Cemetery, which was opened in 1836 to accommodate a range of burials in the burgeoning industrial city (Sayer 2010: 29). I had known about the site thanks to reading Elmet Archaeology’s own osteoarchaeologist Lauren McIntyre and University of Sheffield researcher Linzi Harvey’s 2012 survey report of the non-conformist crypt, but I had not realised the sheer size and subterranean magnificence of the site, nor of the effort in the construction of the site itself. Andrew’s magnificent talk highlighted the fact that the General Cemetery was, unfortunately, a failure of Sheffield with many residents of the burgeoning city of Sheffield not wanting to be interred in the numerous space saving crypts, and instead wanting to be interred individually in graves. The General cemetery today is a place that is well loved and respected by the city as a key piece of the history of Sheffield, and a place of recognition for understanding the changes in burial law for non-conformist burials. As it happens I am currently reading archaeologist Duncan Sayer‘s Ethics and Burial Archaeology (2010), a fantastic Duckworth Debates in Archaeology book that focuses on contextualising the understanding how we approach buried human remains, both from a historical point of view and of an archaeology wide industry perspective. Sayer, currently a researcher at the University of Central Lancashire, has worked extensively as a field archaeologist on many of the recent post-medieval cemetery excavations in Sheffield. Indeed the Sheffield cemeteries make up a large portion of the case studies used in Ethics and Burial Archaeology and are used as examples of the troubles of trying to both understand the construction of graveyards and of understanding the now-outdated burial laws of the 19th century in a modern context. It is a must read for any archaeologist or interested member of the public to understand the unique and difficult position that the UK currently finds itself in regarding the law of excavation and retention of human remains. But finally at DVAD we had the day double-ended by talks on the Egyptian dead by both Dr Campbell Price, of Manchester Museum, who discussed the appeal of mummies in museums and by Prof. Joann Fletcher, of the University of York, who highlighted the value of working with the non-cadaver material of mummies in both Egypt and the wider world. Both talks were eye opening regarding the practice of how the archaeology and heritage sector study and displays human remains. It was great and inspiring to see such passion and invigoration with which the results of studies carried out by Fletcher et al. were conveyed to a largely public audience. The beginning of my own talk on blogging archaeology. But coming back to my own talk, which was held at the beginning of the day, I have to admit that I was quite nervous before and during the start of my own talk, but you live and learn. As the talk went on I did become to feel more comfortable about the topic and of my own knowledge. However I have taken away a few points on how to improve my own public speaking, and I aim to use these to help address the issues that I faced during my own presentation at DVAD. In fact I think this would probably be a pretty good topic for a future blog post, as presenting and communicating at conferences, and at public talks, is a pretty good skill to have and a must if archaeologists are to present the importance of their research to a wider audience. There was one point in the talk that I had hoped to make but had unfortunately forgot to include it. That is that the blogging format is an evolving body of text, one that needs constant revision and refinement but is, nonetheless, one of the strengths and one of the weaknesses of the blogging format. Content, not format, is the important part of any communication, especially in the blogging world where the audience faces so many distractions at the touch of a button. My own talk was actually influenced by the fantastic blogging carnival that Doug, of Doug’s Archaeology, carried out ahead of the SAA conference in April of this year. My own five blog entries for the carnival forced me look again at why I blog archaeology, the effect it has had for myself and for understanding the benefit of discussing the importance of the human skeletal remains in archaeology generally. I should also state here that I am extremely grateful to Kristina Killgrove (of Powered By Osteons), Doug Rocks Macqueen (of Doug’s Archaeology), Sam Hardy (of (Un)free Archaeology) and Katy Meyers (of Bones Don’t Lie) for providing quotes on why they blog, which I used in my presentation as examples of the reasons. It is these bloggers, and many others, that provide me with the inspiration to carry on blogging. All in all I thoroughly enjoyed my day at DVAD. I met some great people, I learnt a lot and I had a wonderful time whilst doing so. I owe a big thank you to Chris, Alex and Lauren at Elmet Archaeology for all of their hard work for putting on a great conference, and here is to next years conference! It seems that we have also entered the season of the (bio)archaeology conference. This weekend will see me attending the University of Durham Engaging with the Dead conference, and it is an event that I am particularly looking forward to. It will be two packed days of exploring changing human beliefs about the body, death and mortality over 8000 years. The event will have a particular focus on the archaeological remains of human bodies and of traces of mortuary culture in Britain and the Levant, as a part of the on-going Invisible Dead project, which is itself based at the University of Durham. The photographs here appear with the courtesy of Alex Sotheran. The Elmet Archaeology blog has a nice little summary of the day’s speakers along with some great photographs, read more here. The University of York Mummy Research Group Home Page has detailed information on the analysis of the many mummies that the group has looked at and continues to study. The Rampart Scotland homepage can be found here, with information on the range of hillfort sites in Scotland and the importance of these longstanding monuments in the landscape. The EngLaID home page, the project to analyse change and continuity in the English landscape from the early Bronze Age to the Domesday survey, can be found here. The site blog also have a review of DVAD here. McIntyre, L. & Harvey, L. 2012. Non-Conformist Crypt Survey, General Cemetery, Sheffield. Report No. GCN01. University of Sheffield. Unpublished report. Sayer, D. 2010. Ethics and Burial Archaeology, Duckworth Debates in Archaeology. London: Gerald Duckworth & Co Ltd.
Dr Lauren McIntyre is an osteoarchaeologist based in Sheffield, England. 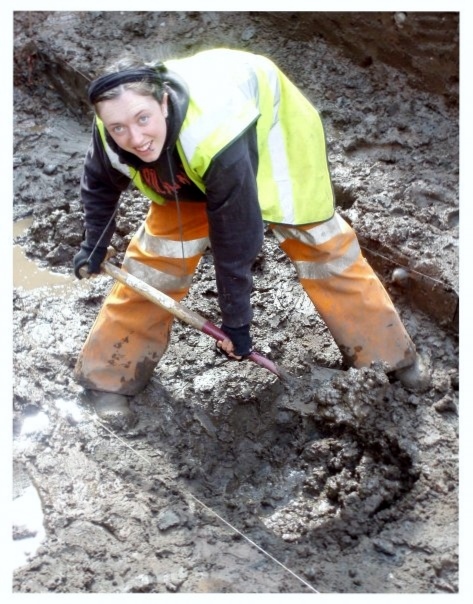 Having recently completed her PhD at the University of Sheffield on analysing the Romano-British human population of York, she is currently working as a project officer and osteoarchaeologist for Elmet Archaeology. Volunteers for Elmet’s ongoing projects are welcome and Lauren can be contacted at l.mcintyre at elmetarchaeology.co.uk for further information. As well as her fascination for all things archaeology and bone related, Lauren has a particular passion for horror films and can often be found at Sheffield’s own Celluloid Screams film festival. These Bones of Mine: Hello Lauren, welcome and thank you for joining me at These Bones of Mine! For those that don’t have the pleasure of knowing you, please could tell us a little bit about yourself and your archaeological research? Lauren McIntyre: Hi David, it’s nice to be asked! OK, so I finished my undergraduate degree in Archaeology and Prehistory at the University of Sheffield in 2004. I returned there to do an MSc in Human Osteology and Funerary Archaeology in 2005. I started my PhD there in 2010, which I’ve just completed. I’ve spent the time between completing degree courses working as a professional field archaeologist and osteoarchaeologist. I’ve worked for a number of commercial field units such as ARCUS, Mike Griffiths and Associates and On-Site Archaeology, and I’ve also done a lot of work supervising and teaching on student fieldschools and community archaeological projects. I got my osteological “big break” as it were with On-Site Archaeology in 2008. I’d already worked as field staff of their excavation of the medieval All Saints Fishergate cemetery the previous year. This was right at the beginning of all the economic problems in the UK, and there were problems with the developer who owned the site and trying to establish a budget for post-excavation analysis of the vast quantity of human skeletal remains that we’d already removed from the site. I helped put together a funding bid to the AHRC for post-excavation osteological analysis with Andrew Chamberlain (then University of Sheffield, now University of Manchester). 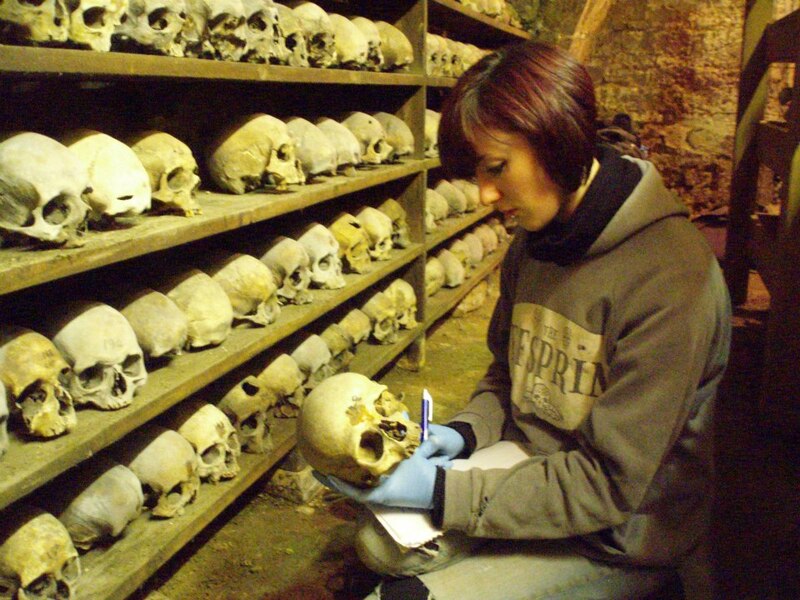 Lauren analysing some of the crania of the charnel material at the medieval Rothwell crypt in Northampton, England. Fortunately we won it, so I spent a year analysing about 750 Roman, medieval and post-medieval skeletons. We’d had a big surprise on the site in that as well as the medieval cemetery, we also found ten post-medieval mass graves that no-one knew existed. Research showed that they might have been Parliamentarian soldiers killed by infectious disease during the 1644 siege of York. So as well as the osteological report we did an article for Current Archaeology, a (rather ill-fated) TV programme for the BBC and a ton of other media output. Since I finished writing up the Fishergate assemblage, I suppose my next big move was conducting and completing my PhD. Again, I was funded by the AHRC to conduct a comprehensive analysis of all the Roman skeletal material from York. My aim was to reconstruct the population in terms of size and composition, diet and health status. I collected data for nearly 800 individuals, either by using data from modern osteological reports or analysing the bones myself. It was a really tough job, but I’m pleased with the results! I finally had my PhD signed off in February this year, and I’m now working for Elmet Archaeological Services, organising their conference and workshops series, and putting together funding proposals for new osteological projects. TBOM: That certainly sounds like you have studied a large number of individuals in some pretty interesting assemblages! How important has it been that you have had both the academic experience and the professional field experience of excavating and studying human skeletal material? Lauren: I think it’s very important to get both. There are plenty of researchers (and not just in osteology) who go straight through University from one degree to the next, and never go out in the field to get excavation experience. I’ve even heard people saying that they don’t want to try excavation because they don’t think it’s relevant to their work! The long and short of it is that yes, academic work and experience is important, and helps you learn to construct a sound research design, formulate research questions, learn the methodologies and so on. But working in the field, even for just a few weeks, makes you learn about the process by which remains are dealt with before they get to the lab, and also helps you to understand how important the other site data is to any project you may be working on. Researchers sometimes have a habit of getting stuck in their own tiny niche, and forget that much of the work they’re doing may be rendered completely pointless if they don’t consider other information from the site that will help both interpret and put their own work in context. I think working in the field is highly beneficial to anyone who wants to work as an archaeological specialist, and also gives you a healthy appreciation and respect for the field archaeologists without whom specialists would have no material to work on! TBOM: Indeed, I have to agree with you on the benefit of working in the archaeological field if you can. Just to take a quick step back to the basics – what was it that made you want to study human skeletal remains? What were your inspirations, and has it been anything you thought it may have been like? Lauren: I’d never really thought about taking on an archaeological specialism – I always intended to stick with field archaeology. I never even studied osteology during my undergraduate degree! I had done some work on prehistoric funerary practices (my undergraduate dissertation was supervised by Mike Parker Pearson, investigating post-mortem treatment of the dead in Bronze Age Britain), but nothing directly involving human bones. Then, when I was working for ARCUS (University of Sheffield’s commercial field unit), I got asked if I’d mind working on the Sheffield Cathedral cemetery excavation for a week because they were short staffed. I said yes, and I’m so glad I did. I totally fell in love with human skeletons! I think the thing that gets me most is how amazing the human body is – how much we can learn from just the bones, how much stress the skeleton can put up with, and how it responds to different stimuli. Some of the pathological specimens I’ve seen are absolutely incredible – in this age of sophisticated medicine, we don’t often encounter gross pathological cases, but looking at archaeological examples you can get an idea of just what the human body can cope with if it needs to. Lauren working on an archaeological site in England. The field archaeologist has to work in all weather conditions, often where wet mud is a perennial friend. There are some really inspirational, hard working people in human osteology, who always work to a very high standard. Charlotte Roberts in particular is a great researcher, who has conducted some invaluable work in this field. Malin Holst is another researcher who works really hard and has produced some great work. I think Jo Appleby has done exceptionally well with the Richard III study. Work produced to such a high standard continually motivates me to improve myself and become a better researcher. It can be very competitive working in human osteology, because there are so many talented osteologists and only a limited amount of new finds or jobs in osteology every year. I didn’t really expect it to be such a competitive field when I first got into it – but you soon learn! Having said that, I have been fortunate enough to work on some great material, so it just goes to show that if you continue to work hard, you can maintain a career in this subject. TBOM: For readers who are interested, what happens to a human skeleton once you have found an individual on an archaeology site? How is it processed? Lauren: Well, the skeleton will be cleaned, recorded and lifted from the excavation site. Once it is bagged up and labelled, it will be sent either to be cleaned and analysed by the osteologist, or it will be put into storage (in some cases bones will be stored until the excavation has finished so that all the bones can be sent to the osteologist at the same time). Once the bones have arrived at the lab, they will be carefully cleaned by the osteologist – either dry brushed or washed in water over sieves so that any small fragments will be caught during the washing process. If the bones have been washed they will then be left to dry for a few days. It’s very important that bones are left to dry at room temperature – extreme temperatures (either very warm or very cold) are not good for the bones and can cause them damage. Room temperature should also be monitored if bones are being stored long term, for the same reason. Once the skeleton had dried it will undergo osteological analysis. Once analysis is complete, it may either return to storage, if the bones are being curated for educational or research purposes. In some cases, the bones will be reburied instead of being stored. TBOM: It is well known within the archaeology sector that, at least in the UK, human osteology can be a very competitive field, but I think it is that core attraction of studying the skeletal remains our of past ancestors that draws so many to study the subject of archaeology as a whole. Would you have any advice for someone starting out in archaeology who perhaps has an interest in pursuing human osteology or bioarchaeology? Lauren: Absolutely, people are fascinated by the physical remain of our ancestors – despite occasional controversies, human skeletons and mummies and suchlike are usually the most frequently visited archaeological remains in museums. So it’s unsurprising that it’s such a popular area of study. I would say that if you’re wanting to pursue a career in human osteology or bioarchaeology, at first have a good think about it – as I said before, it is a very competitive field, and will require a lot of dedication and hard work. There is a lot of competition for jobs, so you have to be good at what you do. The next step would be to acquire suitable training – usually a masters degree in the subject. You can visit the BABAO (British Association of Biological Anthropology and Osteoarchaeology) website to see a list of institutions that offer degrees in human osteology. Joining BABAO is also a good step to take, as they set the professional working standards for human osteology in the UK. As well as a degree, it’s necessary to get a lot of experience in handling and identifying human skeletal remains. This is where a lot of people tend to fall down – they think that because they have a degree, or maybe attended a couple of courses, that they’re all set to go. There is no substitute for practical experience. I usually recommend to students that they start off getting handling experience with helping to do things like bone washing or cleaning. When you’re processing hundreds of tiny fragments, you soon learn how to identify where in the skeleton they’re from. You really start to notice the diversity in shape and size of bones in different individuals, as there’s a massive spectrum of normal variation (inexperienced osteologists sometimes tend to interpret features on bones as pathological, when often the features just have a slightly different appearance to what the person has observed before and are actually completely normal). It also helps to get you used to distinguishing post-mortem and taphonomic damage from genuine osteological features. Lastly, I’d recommend that you put yourself out there and talk to people! As with any job, nobody is going to offer you work if you don’t put yourself out there. So go to conferences, do talks for community, student and any other interested groups and get to know people. Once people start to know your name you can build yourself a reputation, and hopefully this will lead to work. Be positive and keep trying! TBOM: Great answer, I thoroughly agree that you have to continually handle skeletal material to get a feel for natural variation in remains. To add to your point I also took a short course in animal remains, as I think it is important to be able to identity different species as well. Speaking of studying skeletal populations, as a part of your PhD research you studied the human skeletal remains of Roman period York (71AD to 410AD), what was your main project aim and how did you achieve this? Lauren: Well, I wanted to see how far I could use skeletal material to reconstruct the population. More specifically, I wanted to look at population size and composition, diet and health. This came out of my frustration at the situation in archaeology whereby academic and commercial archaeologists rarely talk to each other. So there is a lot of skeletal (and other archaeological material) that’s been excavated by commercial archaeologists, but is completely unknown to the academic sector. At York, there was a load of Roman skeletal material that had come up on commercial excavations, and in particular, a lot of piecemeal burials all scattered around the city. Nobody had put the information for all these burials together to make a bigger assemblage – instead, anyone examining the population of Roman York tends to rely on one or two larger assemblages (Trentholme Drive and the Railway cemetery). I wanted to see how our perception of the population would change once I’d factored in the piecemeal burials. Data collection was difficult, but I’m happy that I got a decent sample, even though I didn’t quite get hold of all the material I wanted. I got hold of a couple of human skeletal databases from City of York Council, I bugged commercial units for reports, nagged every museum I could think of about their collections, spent a long time trawling online archaeological databases such as ADS and Heritage Gateway. But it paid off! I think persistence was the key. 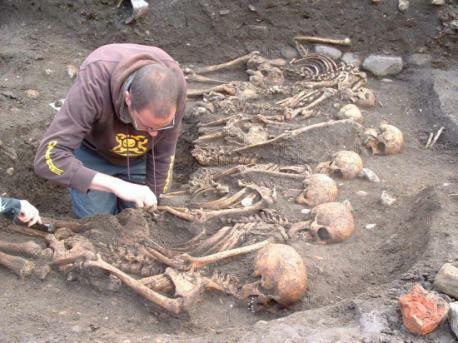 An archaeologist (one Alex Sotheran, founder of Elmet Archaeology) and Lauren’s hand excavating the unexpected discovery of ten mass burials, which dated from the English Civil war period in the 17th century. A lack of trauma wounds on the mostly male individuals in the mass graves could have pointed to the effect of an infectious disease taking its toll on hard pushed soldiers. Read more here. Once I had the data, it was just a matter of synthesising it in a way that made sense, quantifying everything, applying lots of statistics (I have so many SPSS and Excel documents now it’s not even funny), and then comparing the results to other known data ad evidence to come up with an interpretation. Being methodical and systematic helps. Although it’s a very broad study (I had problems with dating because a lot of the material has never been dated specifically, or even approximately – this meant I had to lump everything together instead of doing an earlier/later comparison and examination of change), I did get results that I’m very happy with. I am the first person to systematically estimate the size of a Romano-British urban population, and it’s looking as though there were more people living there (on average) than we originally thought. I’d like to have a go at re-estimating population size in a few other towns from the same period, to see how thy compare to York and also to other previous population size estimations. The demographic composition part of the study pretty much confirmed what people thought anyway, about the military having a huge bearing on the composition of the population, but at least there is now some tangible evidence to base this on! TBOM: The fact that you are the first person to study the whole Romano-British human population of York highlights, to me, the value that osteoarchaeology can bring to a wider archaeological perspective in understanding past populations, especially in historic periods that we think are already largely well known or studied. For anyone that is interested in the results of your research, is there a publication being considered or any resources that you can recommend? Lauren: Well, I’ve not had much chance to publish anything yet, although that is something I’m thinking about doing. I have been giving talks to local groups about my results over the last few months, and I’ll also be speaking at this years’s TRAC (Theoretical Roman Archaeology Conference) at the University of Reading at the end of March. Hopefully I’ll do some more conferences over the coming year. If anyone’s interested in the subject in general, I highly recommend Patrick Ottaway‘s book “Roman York“, which was a crucial text in terms of my background research. Patrick has spent a lot of his career collating archaeological and historical data from Roman York. Other than the work I’ve been doing, Patrick’s book is the main source that explores the town as a whole rather than focusing on one site or theme. TBOM: As you noted at the beginning of this interview you are currently working for Elmet Archaeology, who are noted for having a strong community and educational outreach background. How has this experience of working for them, helping to organise workshops and a conference for example, differed to the academic, and the purely commercial environments of archaeology, that you had worked in previously? Do you see them as shades of one colour or as different facets of the same dice? Lauren: I think that commercial, academic and community archaeology are very much like different sides of a dice – part of the same whole but distinct from each other. I love community engagement and outreach, as you get to work with very enthusiastic people who are very passionate about the subject, even if that subject is a minor part of a small scale project. I think community archaeology (which is definitely on the rise – Elmet were one of the first – maybe even THE first – community archaeology units, being established in 2009) has the potential to combine the best parts of academic and commercial archaeology. Community projects that are adequately funded enable us to conduct great quality research within a realistic time frame, and using experienced field staff who really know what they’re doing, with the added bonus that the local community can get involved. Although academic fieldwork projects usually have the luxury of lots of time, they are not always funded well enough to be able to employ supervisors and teachers that can work to commercial field standards, and may have to rely on post-graduate students who themselves have little field experience. Students excavating an archaeological site in Yorkshire help to uncover an individual found near an Iron Age deposit. You can read the report of the osteological analysis of this individual (SK 1022) by Lauren here. Commercial archaeology, on the other hand, has a wealth of amazing, talented field archaeologists who are excellent at their jobs, but tendering for contracts between companies often means undercutting each other in terms of time and cost. The things that suffer as a result are job time frames – so the archaeology may not necessarily get the time, care and attention it deserves in order to met developer deadlines – and field staff wages, which are notoriously low. I really think that community archaeology is only going to grow in popularity over the next few years – this has certainly been aided by an increase in public awareness and interest in archaeology, as a result of all the television and other media coverage it gets nowadays. The public are starting to realise that archaeology doesn’t have to involve large scale excavations that dusty old academics do in far away places like Egypt and Greece! Local archaeology groups and communities are increasingly starting to tell us what they want to know about the areas that they live in, and we as community archaeologists can help them find out. As a cheeky aside to this, I should also say that if there are any community (or other) group out there that would like to get involved in archaeology in any way, or have archaeological projects that they would like to undertake but don’t know how, get in touch with us at Elmet and we’ll see what we can do for you! TBOM: I never knew that Elmet were possibly the first community archaeology group! I have taken part in a few local community digs myself and know the value of engaging the local community. I very much encourage readers to get involved with their local archaeology group. Thank you very much for agreeing to be interview Lauren, and good luck with your osteological projects and keep up the good work with Elmet archaeology. You can catch Lauren talking about the Roman population of York at the 24th Theoretical Roman Archaeology Conference, which will take place at the University of Reading on the 28th to the 30th of March 2014. Lauren and Isabelle Heyerdahl-King are teaching an intense open to all one-day introductory course on Human Osteology at Oxford Brookes University on the 11th of April 2014. Lauren, with Elmet Archaeology, will also be helping host the Dearne Valley Archaeology Day 2014 on the 31st of May 2014. The one day conference will feature a range of papers on a variety of topics in a friendly setting. You can also learn more about the work that Elmet Archaeology conduct with local communities here. They conduct a broad range of projects taking in everything from exploring WW2 prisoner camps to reminiscence groups, find out more here. McIntyre, L. 2009. SK 1022, Bilham Farm, Brodsworth. Human Bone Assessment Report. Unpublished report. The University of Sheffield. (Open Access). McIntyre, L. & Bruce, G. 2010. Excavating All Saints: A Medieval Church Rediscovered. Current Archaeology. 245: 30-37. (Open Access). McIntyre, L. 2011. Osteological Analysis of the Stanwick Skull. Unpublished report. The University of Sheffield. (Open Access). McIntyre, L. & Harvey, L. 2012. Non-Comformist Chapel Crypt Survey, General Cemetery, Sheffield. Report No. GCNC01. Unpublished report. The University of Sheffield. (Open Access). Ottoway, P. 2004. Roman York. Stroud: The History Press. Ottoway, P. 2013. Roman Yorkshire: People, Culture & Landscape. Stroud: The History Press.